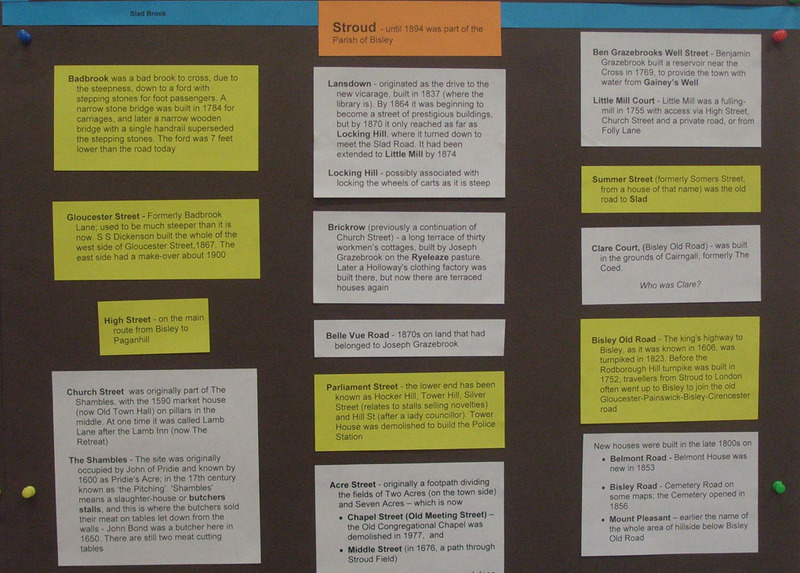 The Borough of Stroud was constituted in 1832 with two Members of Parliament, as a direct consequence of Lord John Russell’s successful Reform Act that extended the vote to a wider range of citizens. Lord John Russell, a son of the Duke of Bedford, had been in Parliament since 1813, and in 1834 was a member of the government. He was unsuccessful in Devon in the January 1835 election, so the newly elected Stroud MP, Colonel Fox, resigned and Lord John Russell became one of Stroud’s MPs until 1841. He later became Prime Minister twice: 1846-52 and 1865-66. 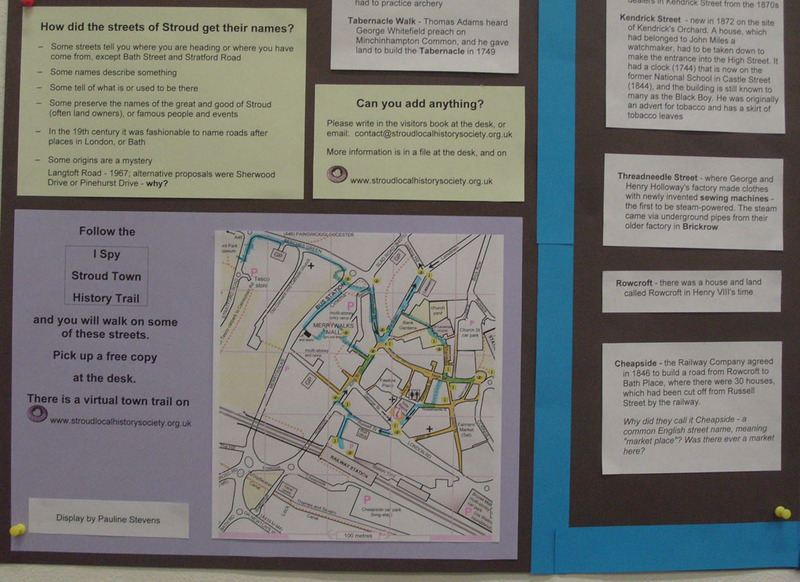 He is remembered in Stroud by the three streets that were named in his honour – John, Russell and Bedford Streets. Also, Brewer Joseph Watts renamed his High Street pub – then just opposite the entrance to Bedford Street – from the Marlborough Arms to the Bedford Arms. Mr Scrope was the other MP for Stroud at the same time, and for much longer (1833 to 1867), but leaves no such reminder. John Street was a former private road/public footpath. Russell Street, was formed from a public footpath after the new London Rd was built in 1814. Bedford Street, former private passage from the High St, was initially called Union St. The Union Chapel was built 1835-7. The name of the chapel was changed to Bedford St Chapel when the street name was changed to Bedford Street. The chapel’s story is told in ‘They Met in a Barn’, by Molly and Alfred Hoy. 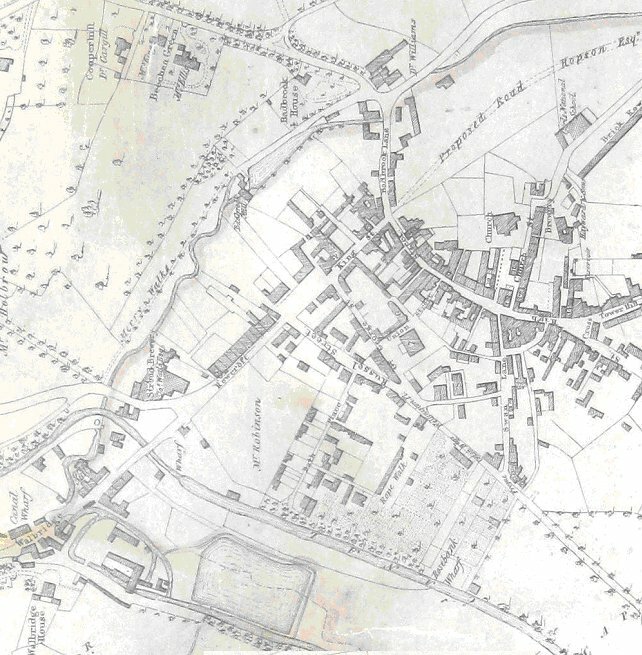 George Street – shown as a path across open fields on Baker’s 1820 map – was Great George St in 1826. The named derived from the Royal George Hotel, at the end of King St (see later). 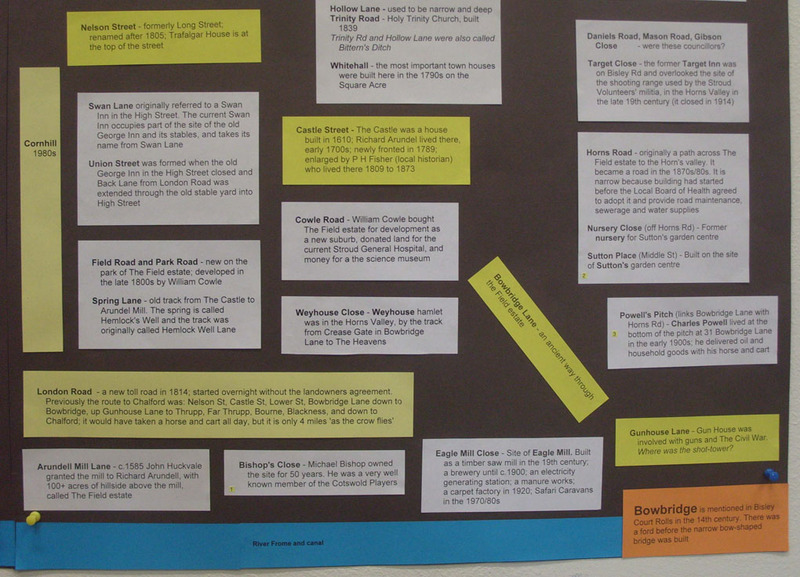 The land around the Subscription Rooms was originally Kendrick’s Orchard – in the title deeds for the Rooms it is called Burroughs Leaze. 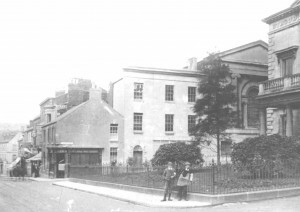 The orchard was sold in 1829 and on it were built the Subscription Rooms (1834), the Casualty Hospital (1835) and the Bedford Street chapel (1835). The fourth (uphill) side of the square was used as a garden by the Subscription Rooms until John Libby built his Cloth Hall. The Dispensary had already been built in 1823, on the corner of George St and Bedford St on land bought from Kendrick’s Orchard (more information here). King Street was named in honour of a visit by King George III in 1788. 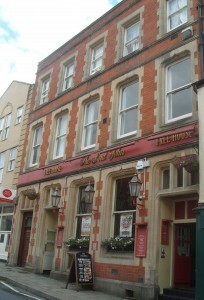 The King’s Arms Inn was on the corner of Kings St, from 1801 to 1819. It was rebuilt by Thomas Wall, who moved his business from The George Inn (see below) in the High St, and it was renamed The Royal George Hotel, with its frontage facing down Rowcroft. 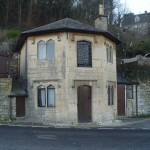 For twenty years it was the home of the Stroud Freemasons. The hotel closed in 1916 and part of it became the Picture House cinema, with Hepworth’s tailors on the ground floor. It was rebuilt in the 1930s, by Burtons, and is now Savers. The current Union Street was originally a continuation of Swan Lane (also called Back Lane at the time) to Capel’s orchard. In about 1813, Thomas Wall purchased The George Inn, in the High St, which had been for many years the principal hostelry in the town, where meetings, balls, assemblies and public and private gatherings were held. With the opening of the new London Rd in 1814 and the town’s development, he decided to move his business. Having rebuilt The Kings Arms and renamed it the Royal George Hotel, Thomas Wall moved his business from the old George Inn, High St, to The Royal George Hotel, in 1819. The Old George’s chamber and assembly room over its gateways were removed, the closed stable yard was opened up and Union St was formed, from the High St on the opposite side from The Shambles, to the new London Rd. The current Swan Inn occupies part of the site of the old George and its stables. 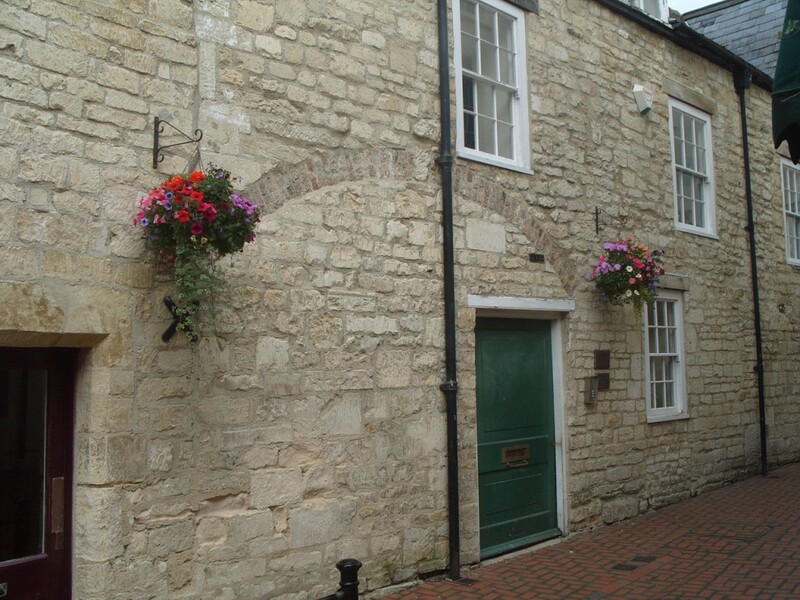 It takes its name from Swan Lane, which originally referred to an old Swan Inn in the High St, with its stables behind. By 1871 it had been changed into a shop and house. On entering Union St from the High St you can see on the right, a blocked up arch which formerly led to the bar and front parlour of the old George Inn. Anyone looking for an address in the town centre needs to know that although the level streets (King St, Kendrick St) are now numbered conventionally, with odd numbers on one side and even numbers on the other, the up-down streets (High Street, George Street, Russell Street, London Road) are numbered up one side and down the other. The High Street house numbers 35-43 (at the top) and London Road 19-29 (past the London Road hotel) have been demolished. 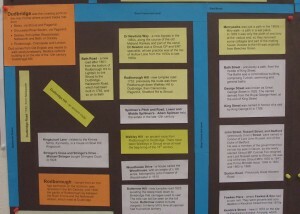 This up-one-side down-the-other numbering scheme continues up the old roads of Nelson Street, Middle Street and Lower Street. 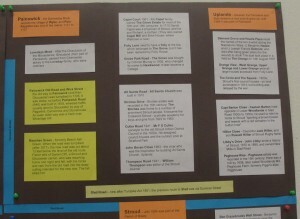 There is much more information about Stroud’s old streets and houses in ‘Notes and Recollections of Stroud’, written by Paul Hawkins Fisher in 1871. It was reprinted in 1986. How did the streets of Stroud get their names? Langtoft Road – 1967; alternative proposals were Sherwood Drive or Pinehurst Drive – why? 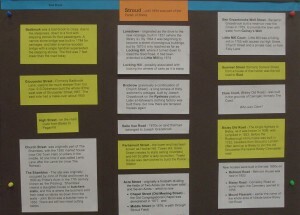 Bath Road – a new road after the Stroud to Lightpill Turnpike Act 1801; linked Stroud, via Rowcroft and Wallbridge, to LIghtpill; it joined the road from Dudbridge via Lightpill to Nailsworth and on to Bath, which had been built in 1782. A temporary link from the bottom of Rodborough Hill to Lightpill had been made in 1788 for King George III’s visit. Cainscross Road – a new road in 1825. 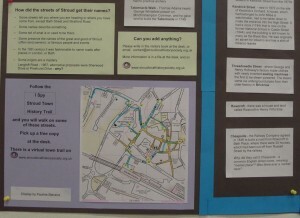 Previously Stratford Rd + Paganhill Lane was the route from Stroud to Cainscross. In 1825 a new road was formed from bits of old tracks, to make a more direct route. Dud comes from Old English and means to walk slowly/unsteadily. Redlers redbrick building is on the site of the 12th century Dodebrigge Mill. Gloucester St – Formerly called Badbrook Lane which crossed Slade Brook by a ford, with stepping stones for foot passengers. A narrow stone bridge was built in 1784 for carriages, and later a narrow wooden bridge with a single handrail superseded the stepping stones. The ford was 7 feet lower than the road today, so Badbrook Lane was much steeper than Gloucester St is now. Sebastian Stewart Dickenson built the whole of the west side and renamed it Gloucester St, replacing The Chequers Inn and some cottages on the corner of King St, c.1867. The east side had a make-over about 1905. The name Badbrook comes from it being a bad brook to cross, due to the steepness down and up to. Badbrook house was demolished to allow for road widening. Beeches Green – formerly Beech Ash Green. It is Meachs Green on Isaac Taylor’s 1800 map. When the road was turnpiked (after 1817), the new road was cut about 13 feet below the level of the old route. Fisher tells of Daniel Clift, a Stroud and Gloucester carrier, when returning home at night, fell with his horse and cart, from the old road into the deep cutting intended for the new one, and was killed. Horns Rd was originally a path across The Field Estate to the Horn’s valley. It became a road in 1870s/80s. London Rd – a new toll road in 1814, started overnight without all the landowners permission. 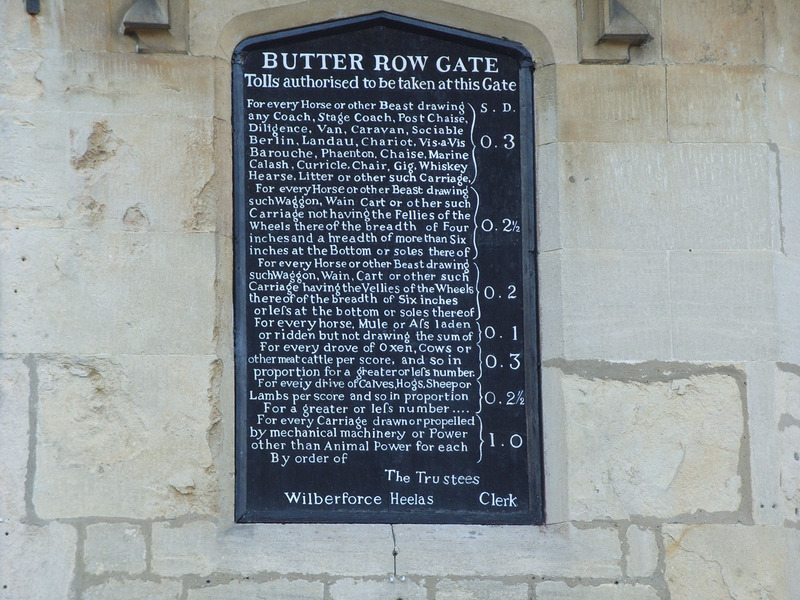 Previously the route to Chalford was: Nelson St; Castle St; Lower St; Bowbridge Lane down to Bowbridge, up Gunhouse Lane to Thrupp hamlet; Thrupp Lane and Bourne Lane through Far Thrupp, Bourne, and Blackness, and down to Chalford – it would have taken a horse and cart all day, but it is only 4 miles ‘as the crow flies’. Paganhill Lane – part of the ancient way from Dudbridge to Stroud. 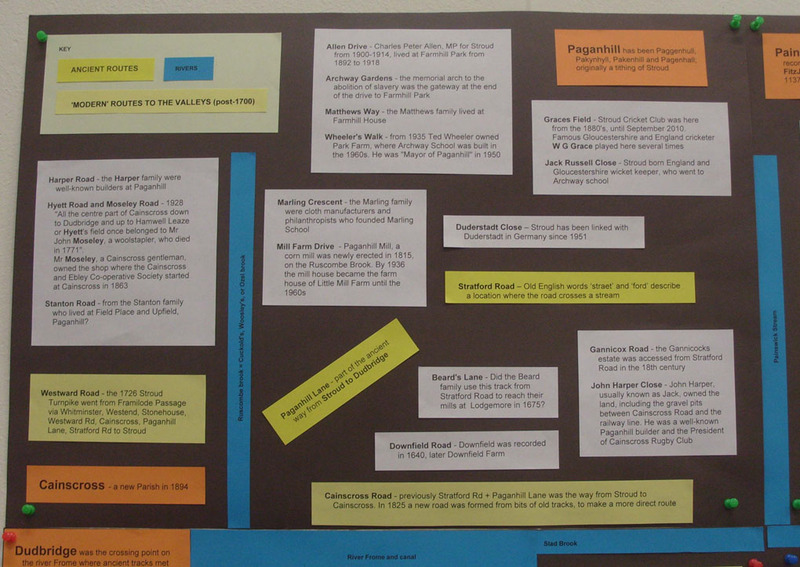 Paganhill has been Paggenhull, Pakynhyll, Pakenhill and Pagenhall, and was originally a tithing of Stroud. Painswick Old Rd and Wick St – The old way to Painswick (and then Gloucester) turnpiked in 1726. However wheeled traffic usually went to Gloucester by way of Paganhill, Cainscross and Stonehouse, because that route was less steep than Wick St.
Painswick Rd. The new Stroud – Pitchcombe – Horsepools – Gloucester road was built in 1818, with the link from Pitchcombe to Painswick in 1819 and on to Cheltenham in 1820. The earliest route from Painswick to Stroud followed the road to Bisley as far as Bull’s Cross and then joined an ancient ridgeway over the summit of Wickridge Hill to Stroud (presumably down Folly Lane to Beeches Green). Slad Rd – Turnpike Act 1801. 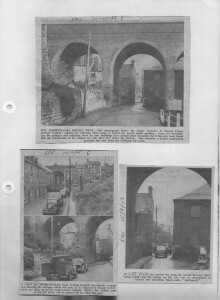 Previously the route to Little Mill (at end of Lansdown) was via High St, Church St and a private road (now Brickrow). Bath St – previously a path from the middle of King Street. The Public Baths was a commodious building, comprising Turkish, swimming and general baths. Belle Vue Road was constructed c.1870 on land that had originally belonged to Mr. Joseph Grazebrook. This gentleman had previously owned a private bank next to Stroud Brewery, and built houses at the top and bottom of Rowcroft. Brickrow (previously a continuation of Church Street) – a long terrace of thirty workmen’s cottages, early 19th century also built by Mr. Joseph Grazebrook on the Ryeleaze pasture. Later a Holloway’s clothing factory was built there, but now there are terraced houses again. Merrywalks was just a path in the 1800s – Miry walk – a path in a wet place. Access to the Hill was originally from Beeches Green. 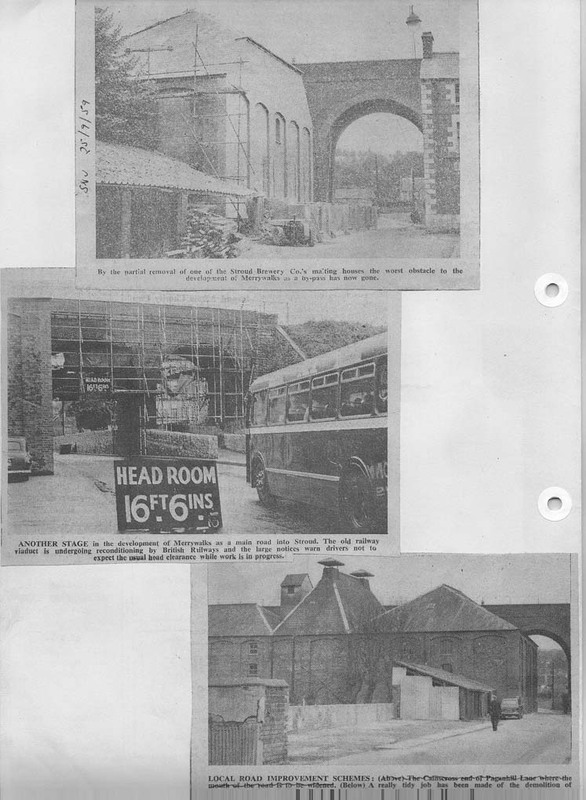 Until 1959 it was only the width of one lorry at the viaduct end, so they removed some cottages and part of the malting house. Middle Hill – P H Fisher says it was “the old occupation road that passes up the central ridge to the fields beyond, and was formerly a public footpath towards Fennels and Bisley. 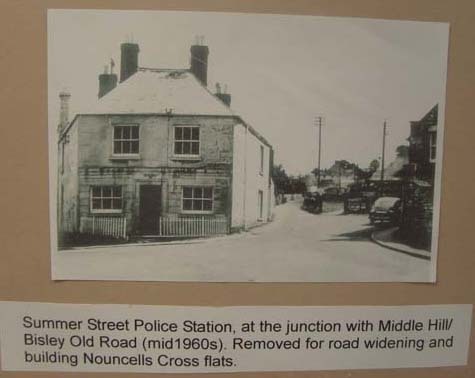 It used to start at Nouncells Cross. All Saints Road – All Saints Church Uplands built 1910, replaced a tin church in Middle St, Uplands, that had been moved from Slad Rd. More information. Birches Drive – The Birches was home to a number of prominent Stroud people including C.P. Allen MP for Stroud). It became the Cotswold School – a private academy for boys and girls from 1922 to 1960. Eagle Mill Close – Site of Eagle Mill. Built in 19th century as a timber saw mill, became a brewery until c.1900, an electricity generating station, and in 1920 a carpet factory – which burnt down in 1954. The site was Safari Caravans in the 1970/80s. Also at one time it was a manure works. Grange View – West Grange, Upper Grange and Lower Grange were off Folly Lane. Grove Park Road – The Grove is now Hawkwood College. By 1842 the house had been badly damaged by fire and was rebuilt by William Capel. The large estate was sold in 1914, but the Capel family retained the house until 1936, when they sold it to Colonel Murray. He changed the name of the house to Hawkwood because of his admiration for Sir John Hawkwood, the colourful mercenary general active in Italy in the 14th century. After 1947 the owners started an English language school there. The Shambles – The site was originally occupied by John of Pridie and was known by 1600 as Pridie’s Acre. In the 17th century it was known as ‘the Pitching’. 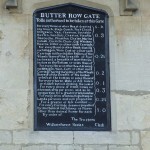 ‘Shambles’ means a slaughter-house or butchers stalls, and this is where the butchers sold their meat on tables let down from the walls – John Bond was a butcher there in 1650. Two meat cutting tables remain. Summer Street was once known as Somers Street, from a house of that name. P H Fisher describes it “lying in a small hollow under the bank, on the left side of its entrance”, and says “the name of this street is erroneously spelled Summer-st”. 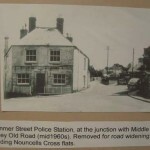 I have been told that Somers House became the Police Station (now demolished) at the end of Summer Street, which was situated on the now grassed area at the junction of Summer St and Bisley Rd. It was used for some time used as a ladies hairdressers shop. Tabernacle Walk On Sunday July 1st 1739, George Whitefield preached at Whitefield’s Tump on Minchinhampton Common. A young man in the crowd called Thomas Adams was so moved that he gave land to build the Tabernacle as an independent nonconformist place of worship in 1749. Arundell Mill Lane – Arundell’s Mill, comprising two fulling-mills and a corn-mill in Stroud and Over Lypiatt, which John Huckvale granted c. 1585 to Richard Arundell. Beard’s Lane – there were Beards in Cainscross and Downfield in 19th century. Lodgemore Mill occupies the site of two earlier fulling mills (Merrets Mill and Nether Latemores Mill), which were both owned by the Beard family from 1675. There has been a mill here since the 1400s. Ben Grazebrooks Well St – Benjamin Grazebrook built a reservoir near the Cross in 1769, to provide the town with water from Gainey’s Well. Bishop’s Close – Michael Bishop owned the site for 50 years. He was a very well known member of the Cotswold Players. The land was inherited by the nephew of Ann Arundel (wife of James who owned the adjacent estate of The Field). Her maiden name was Bishop and she came from Tetbury. Gyde, Bishop, & Co were at Arundell Mill. The Budding – Edwin Budding designed the first lawnmower, which was manufactured at Phoenix Iron Works, Thrupp in 1830 by John Ferrabee – see one at the Museum in the Park. Budding also invented an adjustable spanner. 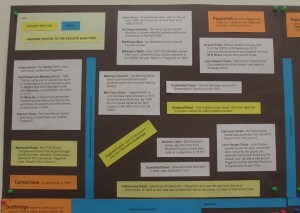 More information: The Budding Foundation, Mower History, Edwin Budding (1795-1846). Capel Court 1961 – the Capel family, owned The Grove Estate for most of the eighteenth century and part of the nineteenth century. In 1710 Daniel Capel was a physician of Stroud, and his son Richard, a clothier. The Grove is now Hawkwood College. They also owned Capel Mill (which can be dated back to 1489) from before 1720 for 150 years, and also Brick House, a substantial classical-style house built c.1720, which was demolished in 1964, where Waitrose is now. 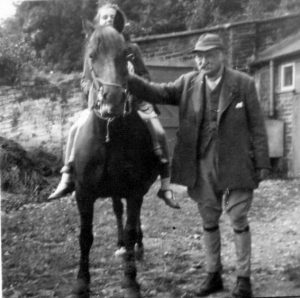 Capt Barton’s Close – Captain Barton lived in Lower Woodlands in Slad Rd and used to ride his horse along Slad Road in the 1930s to 1950s. There used to be a rope walk in a factory where the Close is now. Dr Newtons Way – a new bypass in the 1980s, along the course of the old Midland Railway and part of the canal. Dr Newton was a Stroud GP and ENT specialist, whose practice was The Chestnuts at the top of Hollow Lane from the 1930s to late 1960s. The Chestnuts was formerly New Lodge. Fawkes Place – Fawkes & Son had been grocers and corn dealers in Kendrick Street since the 1870s, with a mill at one side of what is now called Fawkes Place. In 1902 they (or maybe the next generation) opened a wine merchant’s briefly in the High Street, though by 1906 it had moved back to Kendrick St.
Hillier Close is named after Councillor Jack Hillier who served on the Council for many years and he and his wife died in a car crash. Their son is Russell Hillier of Stroud Rugby fame. John Bevan Close 1983 – after the vicar who was the inspiration for building All Saints Church, Uplands. John Harper Close – John Harper, usually known as Jack, was a well-known builder who owned land off Cainscross Road which included gravel pits between that road and the railway line. His property bordered the grounds of the Girls’ Tech (became S.H.S. Junior School when schools were merged 1964). Jack built a house for his daughter on the Cainscross Rd., and was the President of Cainscross Rugby Club. Libby’s Drive – John Libby wrote a history of Stroud, post Fisher, and owned New Mills in Slad Road. Lovedays Mead – The Lovedays were an old clothier family. After the Dissolution of the Monasteries, Stroudend (the southern peninsula of Painswick parish) passed from Cirencester abbey to the Loveday family, the former tenants. 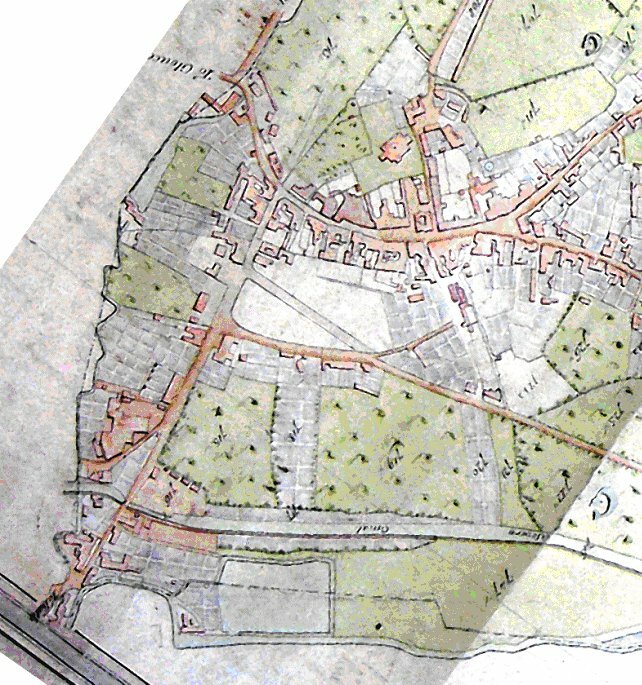 Spillman’s Pitch, Spillman’s Road, Lower and Middle Spillman’s – Spillmans Court derived its name from Adam Spilman, who held the estate in the late 12th century. Stanton Road, Cashes Green – Stantons lived at Field Place and Upfield, Paganhill. Stringer’s Close and Stringer’s Drive – Stringers Court takes its name from Michael Stringer, who bought it in 1628. 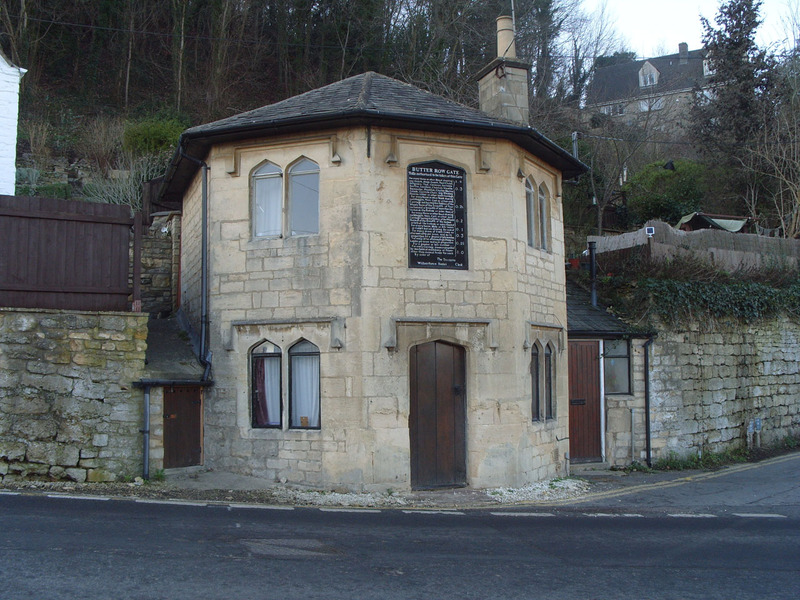 Walkley Hill – There have been Walkleys in Stroud since at least the beginning of the 18th century. It is part of the old way from Minchinhampton to Dudbridge. Carlton Gardens – Carlton House, now the Conservative Cub. Parliament St – formerly known in its western end as Tower Hill, then Hill St (after Margaret Hill, the first women to be elected to the former Stroud Urban District Council); and its eastern end as Hocker Hill then Silver Street (relates to stalls selling novelties) as far as Town’s-end (top of Acre St). Tower House was demolished to build the Police Station. c. 1960 it all became a continuation of Parliament St.
Whitehall is where the most important town houses were constructed from the 1700s on the Square Acre. The houses 1 & 2 Whitehall were built around 1720 & others were added to it & rebuilt. Around 1860 the last houses, next to Hollow Lane were built by a Bucknall, possibly Benjamin or else his brother Alfred. Duderstadt Close – Stroud has been linked with Duderstadt in Germany since 1951. The Stroud District is twinned with Landkreis Göttingen in Northern Germany. This partnership dates back to 1951 when the first steps were taken by youth groups in Stroud and the German town of Duderstadt. Eventually, the two towns became twinned. Cheapside – the Railway Company agreed in 1846 to build a road from Rowcroft to Bath Place, where there were 30 houses, which had been cut off from Russell Street by the railway. Why did they call it Cheapside – a common English street name, meaning “market place”? Was there ever a market here? Clare Court, Bisley Old Rd – was built in the grounds of Cairngall, formerly The Coed.